Last February when I competed in the So You Think You’re Crafty competition, I made an infinity dress. It was “Go Red for Women” week and I thought a sweet little dress for Valentine’s Day would be perfect. 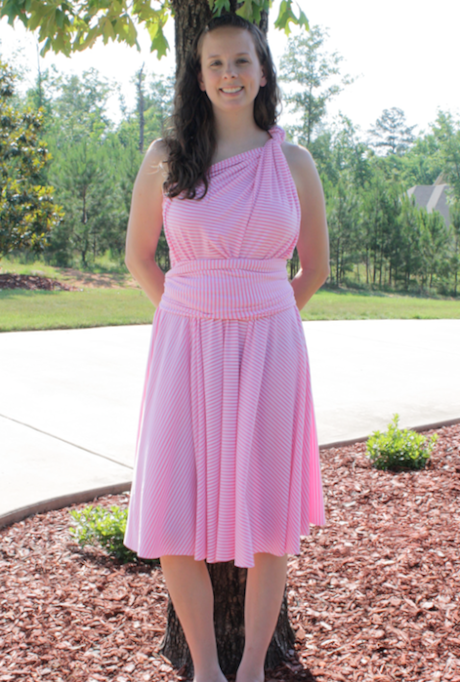 I scoured other tutorials for convertible dresses, but I was confused and frustrated, and decided make my own. My dress had a few mistakes as I was figuring out the best way to make it and upon its completion, it was unwearable for me. I was newly pregnant and the dress accentuated my belly (that we hadn’t told anyone about) and was much shorter than I prefer. Then I discovered the complete lack of modesty in the bust region and lets just say that one the whole, it was better suited for the bedroom than the blog. But since I won the challenge that week, I published my tutorial and went on about my business. Over the last 15 months, that has been the most popular post on my blog! I’ve been absolutely blown away by the number of views, comments, and pins! The love for my tutorial has been overwhelming, to say the least. And it’s made me even more frustrated by my crap-tastic first dress. Don’t get me wrong, the math and the technique are spot on. But the dress I produced was a flop. And for 15 months it’s eaten at me. I’ve gotten many comments and emails asking me about the top half of this dress. Many of you, like me, have to wear a bra and have discovered it’s just not possible. I’ve said many times, “Oh, just make a bandeau top for it” and left it at that. Well, I’m proud to say I’ve finally put my money where my mouth is and made a convertible dress with a bandeau style top for full coverage. And this dress is wearable! I’m so in love with everything about it. Adding the top piece to this dress has opened all sorts of amazing wearing opportunities for me! Areas that would previously be exposed are now nicely covered and allow a bra to be worn. It’s so much more comfortable for me to wear this dress, knowing I’m fully covered. And the styles look just as good! When you see the dress from the front, you don’t notice just how much shows when you turn to the side! I know I didn’t when I made my first one, anyway. The steps to make this version are exactly like my first one. There’s just one tiny, simple difference. Ready to make your own? 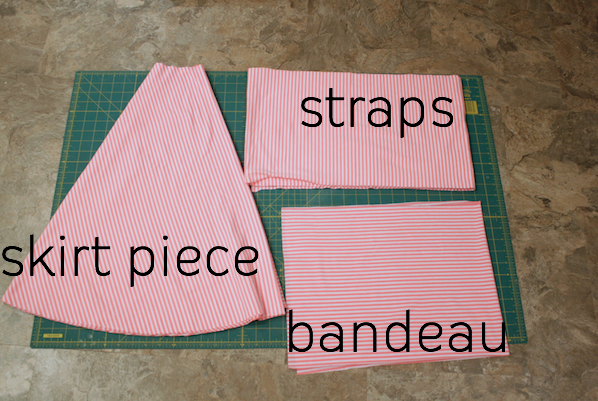 You’ll need to first read my other tutorial as it contains information about how to cut the pieces to your right size. Now, here’s the trick. 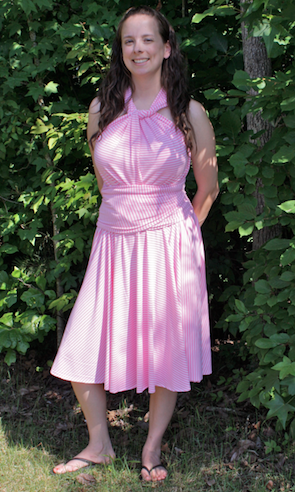 The waistband on my other dress was 1 piece I folded in half and sewn to the skirt. For this version I made it 1 layer thick, but taller, so it would come up higher. That’s it! So my “waistband” piece became the bandeau piece. For me it was 30″ wide by 13″ tall. To sew, gather your 4 pieces. One skirt piece, 2 straps, and the waistband/bandeau piece. Just as before, cross your straps over each other and pin to the skirt. Sew the straps on. 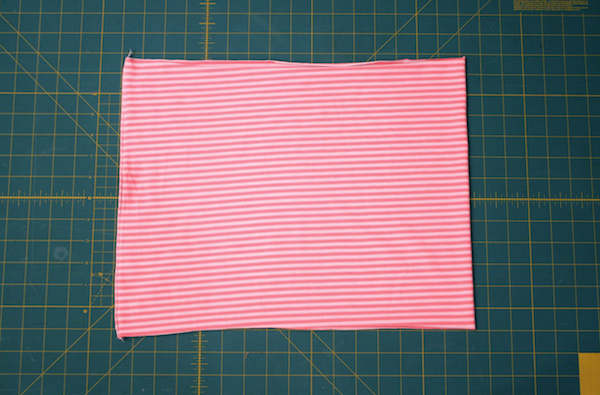 Then take the bandeau piece and fold it in half and sew down the side. This will be a side seam in the top of the dress. 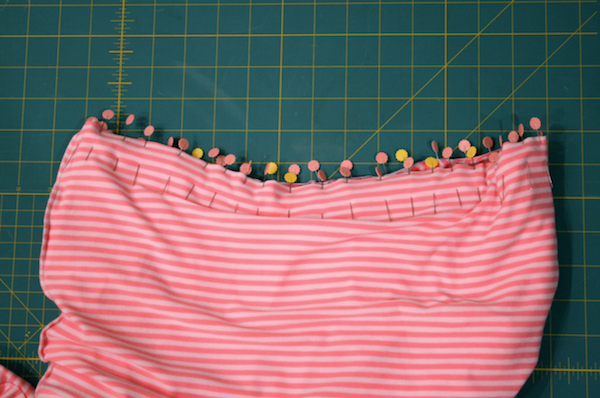 Leaving the bandeau inside out, pin the bottom of your piece to the skirt/straps and sew all the way around. When you’re finished, pull the bandeau piece up and your straps will be sandwiched between it and the skirt with the seam on the inside. It’s ready to wear! I really like this version. I wouldn’t be caught dead in the original – too much showing. I have a question. There is a 20 inch difference between my hips and waist. Would this pattern work or would I need to make the waist larger to fit my hips? Thanks for any help you can offer. I would think you could put it on over your head and be just fine! 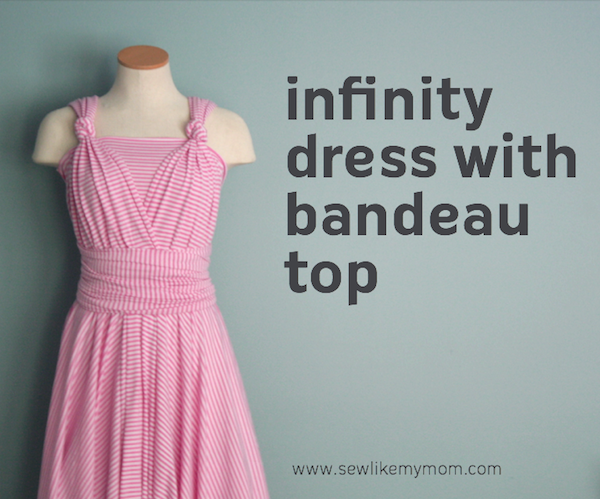 I’ve been wanting to do your little red infinity dress for ages now. But (aside from coordinating time, material, energy, motivation and space!!!! we have three beautiful daughters and so there is not much left for sewing!!!) I wasn’t sure how I would get away from the bra issue. This dress is just as beautiful, far more comfortable AND you look absolutely fabulous in it!!! Thanks for sharing :). 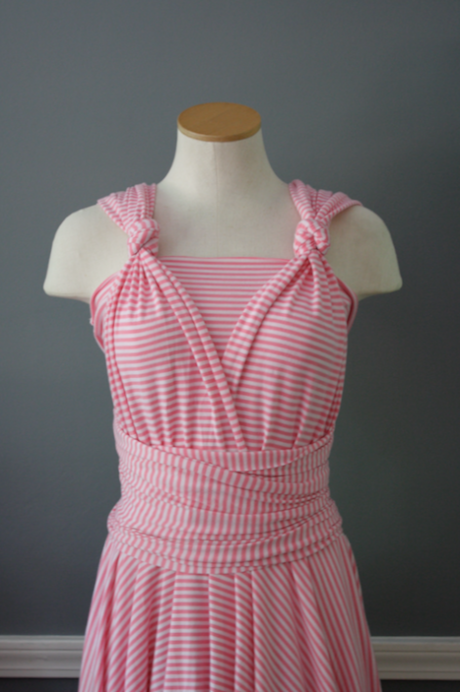 I really love this dress but how do you sew the bandeau top on.i looked at the tutorial but did not understand. Thanks!! You sew it on like you do the waistband in the main dress tutorial. 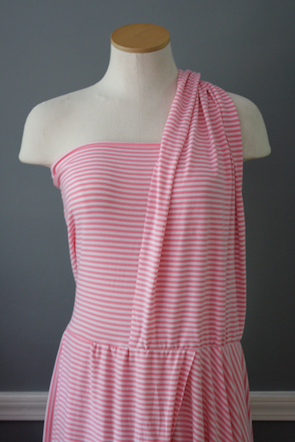 You put right sides together and sew down the side of the bandeau piece to make a tube. 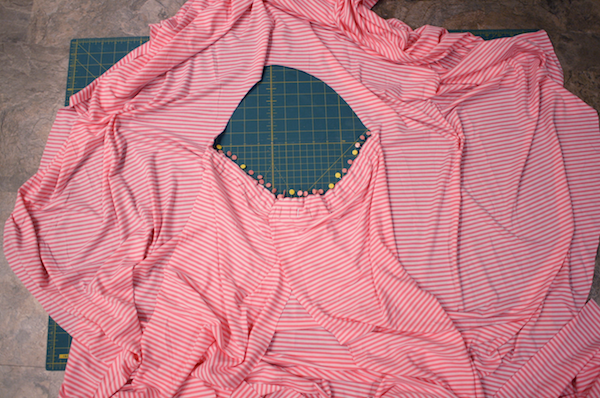 Then turn it inside out and pin the bottom of it around the opening in the dress and sew it on. The straps should be between the bandeau piece and the skirt piece. Thank you, thank you, thank you!!!! I just made this, floor length for the formal dinner on a cruise I’m taking in two weeks. This was a “test” and I couldn’t be more pleased. The test dress is navy blue, the real dress will be in a stunning red much more expensive spandex/polyester. This looks great. Has anyone considered or tried just making it into a shirt & skipping the skirt? Maybe I’m nuts if so tell me but a part of me wonders if you could just make this & just do the bandeau piece and attach the straps and make a cool top. One quick question… Is there a fabric that works best? I’m thinking of making this but want to get fabric that will work well. Thanks!! A light weight knit works best. The heavier the weight of the fabric, the heavier the dress will be to wear. I used a knit-fabric sheet set (as per a commenter’s sugggestion in the other tutorial) and its great 🙂 I used one of the pillow cases as my bandeau. I used one of the pillow cases as my bandeau. Added a narrow fold over hem at the top & threaded thru elastic to help keep it up. Made bandeau and skirt in navy, straps in royal purple. Looks awesome. 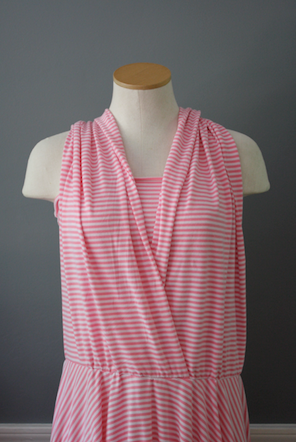 Would make an ideal maternity top, just use the measurement at the level of the bra band as the ‘waist’, shorten the bandeau to cover, and hem to when you need for your bump. I love this tutorial! 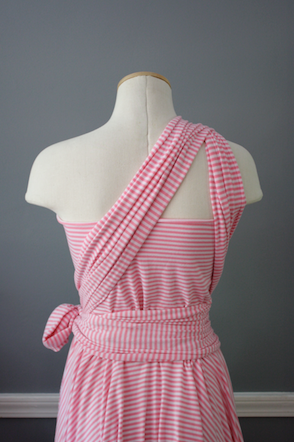 My future MIL and I are making these for my bridesmaids next week, but we’re trying it with a stretch taffeta instead. 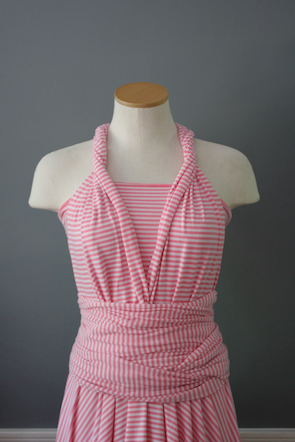 How much shorter were you able to make the straps when you used the bandeau top? I have 17 yards of fabric for 3 dresses, so I’m hoping that it’s enough! Thanks! That should be more than plenty! For the bandeau one with less fabric I had to make a seam in the straps so I wouldn’t recommend doing it that way. I don’t see why not! Making them narrower will also reduce some of the bulk from tying them around you. Great idea! 2) an empire waist dress always fits my body better to you think this dress could be made like that as well and still be functional? I do think you need more fabric, you’ll really want the length in the straps to get them wrapped properly. An empire waist would be precious! Go for it! I love your tutorial, it was the most easy to follow of the ones I found online! I just made a dress as a sample of sorts for my bridesmaids dresses and ended up swapping out the waistband for the bandeau and it works so much better this way 🙂 The problem I ran into was that the waist of the skirt ended up much wider than the bandeau so I have a weird gap. I’m not sure if I goofed in measuring the skirt of if the knit stretched too much in sewing. Did you use a double stretch knit or something that was a bit more sturdy? Has anyone made this with a single sided print fabric? I have my eye on a polka dot lyrca fabric, but the print is only on one side, and I’m not sure how it would work with the straps wrapping around. Do you think the wrong side would show and make it look strange? Melissa, was your stripy fabric printed on both sides? I am so excited about your tutorial. I am mid pregnancy and stuck with one black dress (not fun to look like you are always going to a funeral when you are pregnant). There are not alot of options out there, for maternity dresses, that are affordable and have some color. SOOOO, I am very excited. Thank you! I am wondering how to convert it for a full belly. Do I need to add more gather to the top of the skirt so it will have enough fabric? I was planning on raising the waist and worried about getting enough length could I make the skirt in two half-moon pieces? I would love to know if anybody has some suggestions. I’m supposed to get a dress like this for my bffs wedding in October and all the sellers have these dresses priced $50 – $150 ow! Trying to keep a low budget. Anywho, so I’m making one right now 🙂 it took me about 2 hours to straighten out all the fabric and get it cut. I’m making a mini version for my daughter to wear as her birthday dress. The only issue I’m having is I didn’t realize how heavy the fabric was that we picked out. 🙁 but so far I’ve got everything pinned and lined up ready to sew in the morning after I figure out my machine 🙂 I think I’m going to definitely do some practice stitches first! Thanks so much for the walk through! 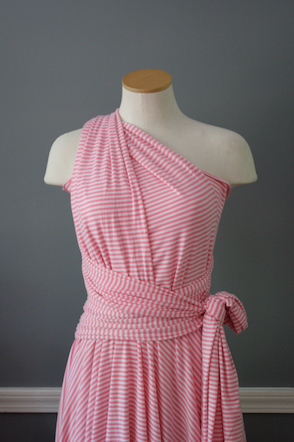 How long is the skirt on this pink and white striped version? 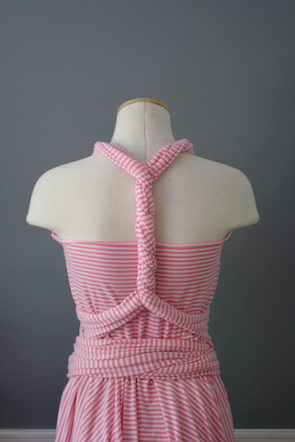 I’ve never made one of these before but if the sides were too bare with the red dress, couldn’t you just make the straps much wider so that they not only overlapped in the front but also wrapped around the sides more? Or would that just make way too much fabric going over your shoulders? Just wondering out loud. I love the Infinity Dress pattern…for my dolls and am really glad you updated the dress with the bandeau. I will now make one for me! Where did you put the seam on the bandeau when you sewed it to the skirt? On the side under the arm? I know in the other you just put it in the front since it wouldn’t show. Yes, I put it on the side under the arm. It doesn’t matter which side, but I wouldn’t do it in the front since it would show. This is awesome! I’ve been wanting to make one of these for a while, but as a larger girl I can’t go bra-less! Thanks for the easy to follow tutorial! No, I didn’t use elastic thread, but you certainly can if you think getting in or out of the dress would be difficult without it! Fantastic tutorial! I have loved these dresses since I bought one a few years ago but I think the bandeau is a great alteration! I always use a 95% polyester 5% spandex knit fabric…it stretches without being bulky or so thin it’s see through when you wrap it. If you buy one it’s usually made of a blend of polyester and spandex. I haven’t read the other comments but I am thinking about making this and wonder about the straps… I don’t have the 136″ I need from the fabric I have and want to use, will it matter so much if I use less? Does it HAVE to be 2x my 5’8+” height? What does it effect if I go shorter? Thanks!! No it doesn’t have to be that long, but you might want it. I would suggest taking some yarn at 2x your height, and tying it to safety pins and pinning it to you where the straps would start. Then “tie” yourself in some of the styles you like the best and would be most interested in wearing. Is your string too long for those styles? By how much? Cut it off if it is, then untie yourself and measure it and you’ll know you NEED at least that much fabric for successful straps. Does that make sense? Happy sewing! This is wonderful, thank you so much for posting! I lengthened the skirt and shortened the width of the bandeau to turn it into an empire waistline and it worked great! This is a wonderful tutorial! Thanks!